Buy Darlac compact snips: <ul><strong><li>Lightweight and compact</li><li>High carbon steel blades</li><li>Includes lever safety catch</li></strong></ul><br>These light and compact snips are perfect for delicate cutting and light pruning.<br><br>More lightweight than secateurs and small enough to sit comfortably in the palm of your hand, they're the ideal choice for precision tasks like flower arranging, deadheading and bonsai.<br><br>The Japanese high carbon steel blades give them a clean precise cut, and their long reach and snappy cutting action makes it easy to get through lots of stems quickly.<br><br>The lightweight aluminium handles have soft non-slip grips to offer maximum comfort when using them over long periods.<br><br>Both the spring and blades are replaceable to keep these snips as springy and sharp as the day you bought them.<br><br>Please note: it is an offence to sell knives and other cutting tools to persons under the age of 18 years. 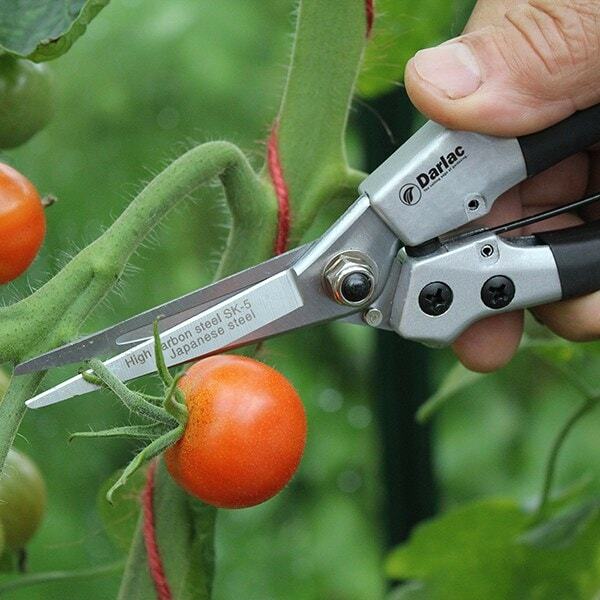 These light and compact snips are perfect for delicate cutting and light pruning. More lightweight than secateurs and small enough to sit comfortably in the palm of your hand, they're the ideal choice for precision tasks like flower arranging, deadheading and bonsai. The Japanese high carbon steel blades give them a clean precise cut, and their long reach and snappy cutting action makes it easy to get through lots of stems quickly. The lightweight aluminium handles have soft non-slip grips to offer maximum comfort when using them over long periods. Both the spring and blades are replaceable to keep these snips as springy and sharp as the day you bought them. Brilliant little snipper. All as described on-line, would buy again. I use this often. It is perfect for deadheading and delicate pruning. Safe to use with the clip to keep it closed when not being used. It has a good feel. I would recommend it.